The Irish Whiskey story is not a lot different from most Irish stories. Good times followed by bad. But there’s always hope. It’s the Irish way that has spawned sad songs, sad stories, sad plays – but seldom sad lives. If you pay attention you will see there is humour, even laughter and joy in the Irish sadness. Often down trodden but never depressed, the Irish make the most of life, and every moment is an opportunity for creativity. A person’s wit and ability to handle life is more revered than their financial wealth. Whiskey was first produced in Ireland, not Scotland. At one time there were more distilleries in Ireland than anywhere in the world. However, by 1990 there were only five left. All owned by one company, all with the commercial sameness. Sad for sure. But a guy by the name of John Telling wasn’t having any of it and set about reviving distilleries such as Kilbeggan, brands such as The Tyrconnell, and a hugely successful imitation of peated Scotch called Connemara. Telling not only revitalized the industry but caused the big producer to bring back brands they had killed such as Midleton. But he’s gone and sold the lot to Jim Beam. Sad again. But not for long, because more new players have surfaced. A virtual distillery is crafting the very good, and well named Writers Tears, and three fishermen recently open the West Cork distillery (one of our Tour stops in June). 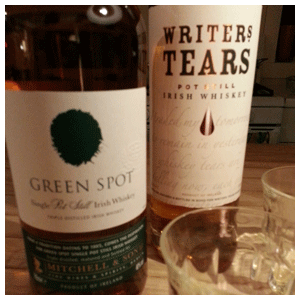 Dublin wine merchants, Mitchells, continues to produce The Green Spot, the country’s only deluxe whiskey. Below are my picks for interest and value. To enjoy not only on the 17th but whenever you’re in the mood for a little Irish joyful sadness. Such as wondering why the patron saint wasn’t born in Ireland!
. . . rustic, challenging. Suggestion of seawater/seaweed on rocks.
. . . bold deep flavours. Shades of bourbon but firmer.
. . . mellow. Whiffs of ocean spray.